Alright guys, about 7 weeks ago I gave in and finally put an order for Z Palette. and just want to let you guys know that I have been eyeing this one up for the l o n g e s t time, but like I don't really have a lot of single eyeshadows so I thought there's no point of having it until recently when I started buying MAC and Elianto single eyeshadows. Last year, when Luxola send me MYR50 voucher, I took that as an opportunity to buy myself one and I was so delighted that I paid for this at MYR27. (Siapa je weyh nak bagi 50 ringgit free kan, kan). On looking at the site, I really liked those in Zebra and black pattern. Unfortunately, both of them were sold out and I came down to this Leopard Z Palette. To put it in words, Z Palette is a customizable magnetic empty palette that allows you to store depotted and refill form of makeup pans in it. The idea behind this is to minimize the amount of space taken up in a makeup kit. 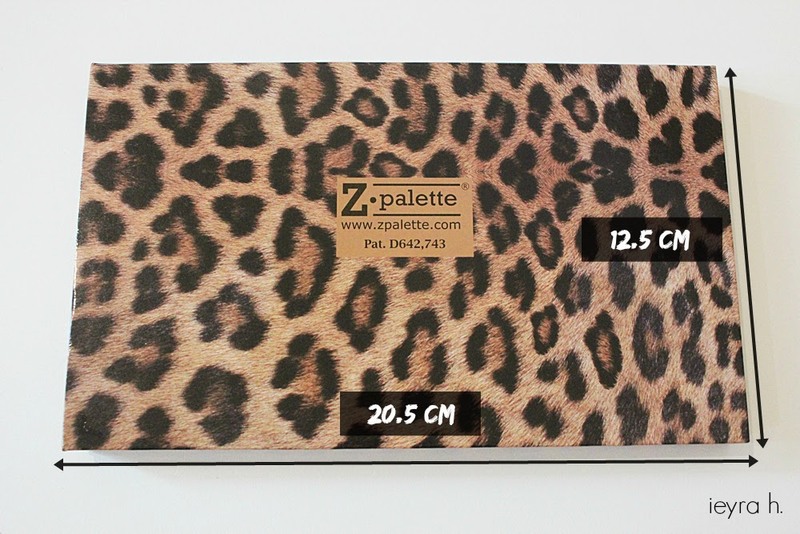 Z Palette is simply made up of cardboard and I'd say it's sturdy enough. I think due to the magnetic board, the palette feels very heavy and I don't feel comfortable travelling with it. The opening is okay - it used a magnetic shutter along the border and it can be easily open and close without fuss. However, I'm here questioning whether this palette will last long because the magnet is not as strong as I thought it would be. but the colour and design selections are limited unlike those in official Z Palette website. Here is the measurements of my large palette. Noted that the overall depth of this palette is 1.5 cm. This palette comes with 10 round pieces and 10 is square shaped of metal stickers. The magnet itself is pretty strong. Several refill eyeshadows / blushes like MAC and Makeupgeek have built in magnetic pan, so you can definitely save these metal stickers for other eyeshadows. Now I am not going to lie... sometimes depotting eyeshadows from it's original packaging can be a bit hard - IF you do not follow the correct techniques and tricks of doing it! Be sure to visit their official website to know more about it. One tip I want to share is to clean all left over glue behind the pan so later on, the metal sticker would able to stick on it properly. On the Z Palette's official website, there is a compilation list of how many eyeshadows of each brands can fit in a palette. You might want to check it out. Here is the (link)! (Malaysia) - I bought mine from Luxola (link). You can check it's international availability at (here). and please do the elianto eyeshadow swatch. I've interesting with their eyeshadow since the got many colours :D.
To be honest, if it wasn't because of the $14 off discount code, I would be a bit hesitate in splurging on this z palette! I wanted to try Elf, but wasn't sure whether it would fit any MAC or MUG eyeshadows. Actually, me too! hahahahah. But new year, new makeups, hopefully mine will be full by the end of this year. Hehe. for stopping by & check out my new post! I had no other choice but to end up w/ this design. It wasn't my favourite, but like you said, it does look pretty!